Army surplus jacket; H&M men's sweater; 7 For All Mankind 'Josefina' jeans; DV by Dolce Vita flats; Kooba Lyndi bag (c/o); vintage Calvin Klein scarf; Ray Ban aviators; Amanda Pearl 'Gobstopper' earrings (c/o); Michael Kors watch. If I had to pick one look from my five-looks-one-bag project with Kooba that most typifies my style, this would be it. Stripes? Check. Flats? Check. A dash of silk & some pearls? Check. If you're ever creeping around in Chelsea or the West Village around brunch hour, you'll probably see me, coffee in hand, in this exact outfit or something frighteningly similar. This outfit is soooo me! I love the rolled jeans, the military coat, the flats and of course, the striped shirt! I also love your scarf, I haven't been brave enough to wear one like that, yet! Thanks for the inspiration. This outfit is so stylish and classy, I love it! Your flats are really cute too! Girl, I know what you mean. I tend to fall into similar styling patterns. It's great having a super stylish look to fall back on, even when you're just going out to grab a coffee! My military field jacket (similar to yours) is definitely part of my go-to look. 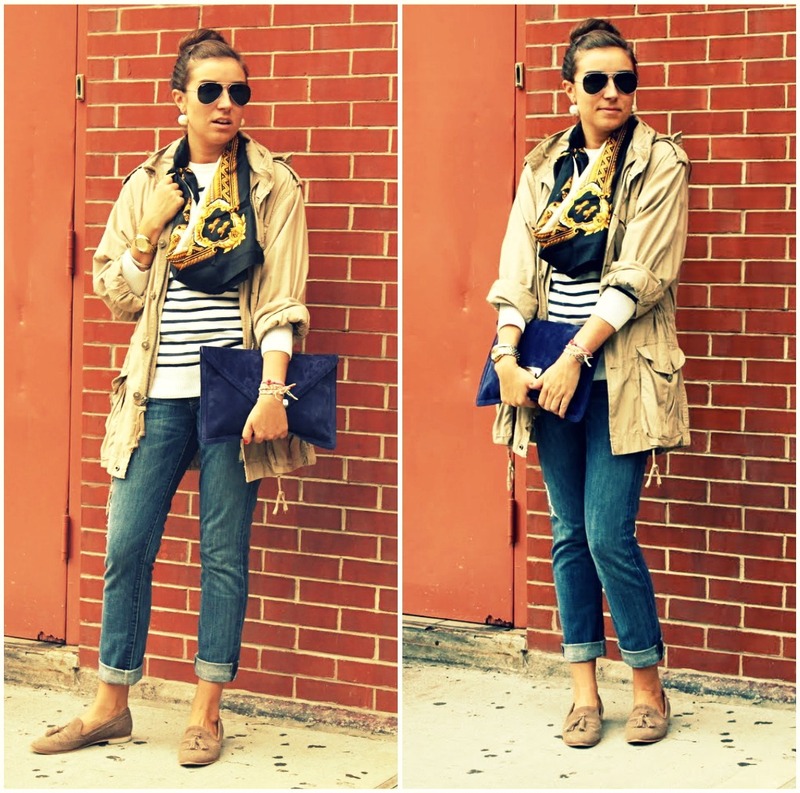 I love this throw together but still chic look. i love the jacket that you threw on too - it really makes the whole look work. and the shoes are awesome! Playing major catch up... LOVE this look!!! Very cool - love the scarf. I have been looking the World Wide Web for this information and I want to thank you for this post. I was very pleased to find this site. I definitely enjoyed reading every little bit of it.